What happens to a port that is associated with VLAN 10 when the administrator deletes VLAN 10 from the switch? The port automatically associates itself with the native VLAN. The port creates the VLAN again. The port goes back to the default VLAN. Refer to the exhibit. Interface Fa0/1 is connected to a PC. Fa0/2 is a trunk link to another switch. All other ports are unused. Which security best practice did the administrator forget to configure? Configure all unused ports to a ‘black-hole’ VLAN that is not used for anything on the network. Disable autonegotiation and set ports to either static access or static trunk. Change the native VLAN to a fixed VLAN that is distinct from all user VLANs and to a VLAN number that is not VLAN 1. All user ports are associated with VLANs distinct from VLAN 1 and distinct from the ‘black-hole’ VLAN. Which command is used to remove only VLAN 20 from a switch? A Cisco Catalyst switch has been added to support the use of multiple VLANs as part of an enterprise network. The network technician finds it necessary to clear all VLAN information from the switch in order to incorporate a new network design. What should the technician do to accomplish this task? Erase the startup configuration and reboot the switch. Erase the running configuration and reboot the switch. Delete the startup configuration and the vlan.dat file in the flash memory of the switch and reboot the switch. Delete the IP address that is assigned to the management VLAN and reboot the switch. What is the effect of issuing a switchport access vlan 20 command on the Fa0/18 port of a switch that does not have this VLAN in the VLAN database? VLAN 20 will be created automatically. The command will have no effect on the switch. Port Fa0/18 will be shut down. An error stating that VLAN 20 does not exist will be displayed and VLAN 20 is not created. Port Fa0/11 on a switch is assigned to VLAN 30. If the command no switchport access vlan 30 is entered on the Fa0/11 interface, what will happen? Port Fa0/11 will be returned to VLAN 1. VLAN 30 will be deleted. An error message would be displayed. Port Fa0/11 will be shutdown. What must the network administrator do to remove Fast Ethernet port fa0/1 from VLAN 2 and assign it to VLAN 3? Enter the no vlan 2 and the vlan 3 commands in global configuration mode. 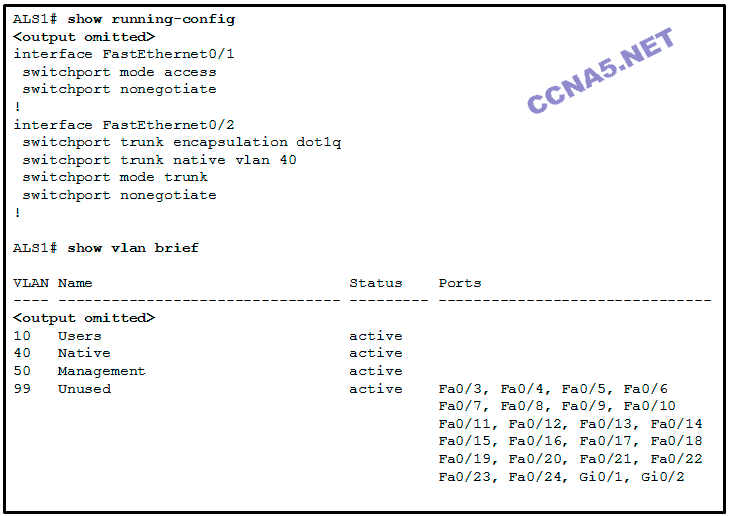 Enter the switchport trunk native vlan 3 command in interface configuration mode. Enter the switchport access vlan 3 command in interface configuration mode. Enter the no shutdown in interface configuration mode to return it to the default configuration and then configure the port for VLAN 3. Disable DTP autonegotiation on end-user ports. Change the management VLAN to a distinct VLAN that is not accessible by regular users. Statically configure all ports that connect to end-user host devices to be in trunk mode. Change the native VLAN number to one that is distinct from all user VLANs and is not VLAN 1. Use SSH for all remote management access. In a basic VLAN hopping attack, which switch feature do attackers take advantage of? A Cisco switch currently allows traffic tagged with VLANs 10 and 20 across trunk port Fa0/5. What is the effect of issuing a switchport trunk allowed vlan 30 command on Fa0/5? It allows only VLAN 30 on Fa0/5. It allows a native VLAN of 30 to be implemented on Fa0/5. It allows VLANs 1 to 30 on Fa0/5. It allows VLANs 10, 20, and 30 on Fa0/5. Refer to the exhibit. A frame is traveling between PC-A and PC-B through the switch. Which statement is true concerning VLAN tagging of the frame? No VLAN tag is added to the frame. A VLAN tag is added when the frame is accepted by the switch. A VLAN tag is added when the frame is forwarded out the port to PC-B. A VLAN tag is added when the frame leaves PC-A. Refer to the exhibit. PC-A and PC-B are both in VLAN 60. PC-A is unable to communicate with PC-B. What is the problem? The VLAN that is used by PC-A is not in the list of allowed VLANs on the trunk. What VLANs are allowed across a trunk when the range of allowed VLANs is set to the default value? All VLANs will be allowed across the trunk. Only the native VLAN will be allowed across the trunk. The switches will negotiate via VTP which VLANs to allow across the trunk. Only VLAN 1 will be allowed across the trunk. Which PCs will receive the broadcast sent by PC-C? The network load increases significantly because of added trunking information. Devices in one VLAN do not hear the broadcasts from devices in another VLAN. The size of the collision domain is reduced. VLANs logically group hosts, regardless of physical location. The number of required switches in a network decreases. Refer to the exhibit. DLS1 is connected to another switch, DLS2, via a trunk link. A host that is connected to DLS1 is not able to communicate to a host that is connected to DLS2, even though they are both in VLAN 99. Which command should be added to Fa0/1 on DLS1 to correct the problem? Which switch feature ensures that no unicast, multicast, or broadcast traffic is passed between ports that are configured with this feature? Fill in the blank. Use the full command syntax. The (show vlan brief, SHOW VLAN BRIEF) command displays the VLAN assignment for all ports as well as the existing VLANs on the switch. Which three statements accurately describe VLAN types? (Choose three). An 802.1Q trunk port, with a native VLAN assigned, supports both tagged and untagged traffic. A management VLAN is any VLAN that is configured to access management features of the switch. A data VLAN is used to carry VLAN management data and user-generated traffic. Voice VLANs are used to support user phone and e-mail traffic on a network. VLAN 1 is always used as the management VLAN. After the initial boot of an unconfigured switch, all ports are members of the default VLAN. 25 Which combination of DTP modes set on adjacent Cisco switches will cause the link to become an access link instead of a trunk link? 26. An administrator has determined that the traffic from a switch that corresponds to a VLAN is not being received on another switch over a trunk link. What could be the problem? 27. What is the default DTP mode on Cisco 2960 and 3560 switches? 28. Refer to the exhibit. What can be determined from the output that is shown? 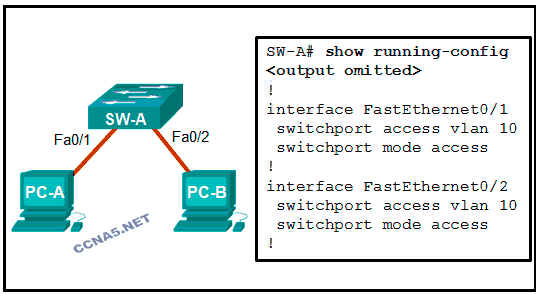 Interface FastEthernet 0/1 is configured with the switchport protected command. Interface FastEthernet 0/1 is configured with the nonegotiate keyword. 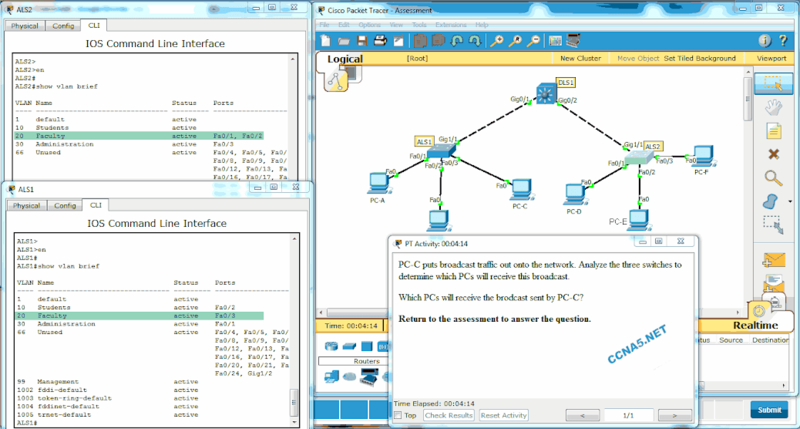 Interface FastEthernet 0/1 is trunking and using Native VLAN 1. Interface FastEthernet 0/1 is configured as dynamic auto by the administrator. They are saved in the running-config file by default. CDP can be used to learn and store these VLANs. VLAN IDs exist between 1006 to 4094. They are commonly used in small networks. VLANs are initialized from flash memory. 31. Which type of VLAN is used to designate which traffic is untagged when crossing a trunk port? 33. What happens to switch ports after the VLAN to which they are assigned is deleted?